Marion High School, located in Marion, Indiana, has a fascinating history. This site is designed to give you a glimpse into the early history of Marion High School, through photographs and text. The 1906 Marion High School yearbook states that public schools were operating in Marion, Indiana by 1856 (Cactus 54). This school was probably without grades and specific departments, for during the 1860's, Welford Weaver noted that the school system was partitioned into grades and a high school course work was instituted (Weaver 4). From the 1860's on, Marion High School has undergone many changes. An examination of the history of Marion High School shows that, as it developed, the school changed buildings, supported many talented students, altered its curricular and extra-curricular offerings, and sustained a dedicated faculty. From early frame structures to large, impressive brick buildings, Marion High School has been located on a number of different sites. Prior to the development of grade levels, the Marion public schools occupied a variety of frame and brick buildings throughout Marion, including a former Seminary building (Weaver 4). In 1879, the high school grades were moved to the Presbyterian Church building rented for this purpose. In the spring of 1882, two new grade school buildings were completed, and the high school moved into the old Seminary building previously used by the elementary grades. In 1887 or 1888, the third story of the Tharp Block (Fourth and Branson streets) was rented for additional space (Weaver 5). As the residents of Marion placed more value on secondary education, plans for the construction of a new high school building began. 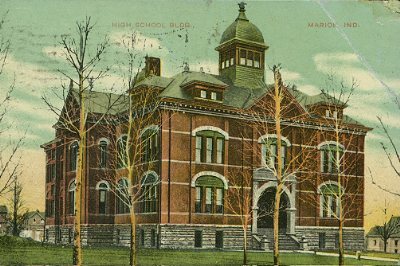 Marion High School's first new building, opened in 1891. It cost $65,000, and employed five teachers when it was opened. 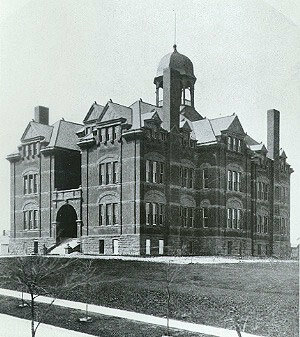 In September 1891, Marion High School moved into its first new school building, which was located between 3rd and 4th streets, just west of Whites Ave--later the site of Horace Mann School and currently of the Horace Mann Apartments (Weaver 5). This brick structure cost $65,000 and was outfitted with the most modern equipment available ("Marion’s"). When the school opened, it employed five teachers. Shortly afterward, two more teachers were hired, and by the fall of 1897, there were nine faculty members (Weaver 5). The school remained in this facility until 1902, when disaster struck. One Sunday evening, the beautiful school building was badly damaged by fire. It is assumed that the blaze originated in the furnace room and spread through the ventilation system, although the actual cause of the fire remains a mystery. The entire building was engulfed in flames, and all attempts by the Marion Fire Department to stop it were futile. The total loss was estimated at $80,000 ("Marion’s"). After an examination of the scene, it was discovered that many of the exterior walls were not badly damaged and could be reused. The school board quickly made plans to rebuild, while classes were held temporarily at the Odd Fellows building ("Will"). 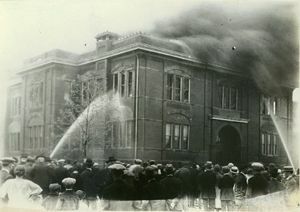 In 1908, Marion's High School building was set on fire for the third time, however it was determined that this fire was caused by arson. Only four years after the building was reopened, in 1906, another fire consumed the structure. This fire, also on a Sunday evening, completely destroyed the building, allowing none of the original structure to be reused ("City"). The building was again rebuilt, but only two years later it burned again. Unlike the other fires, this third fire was suspected to have been the result of arson, since a can of coal oil and a pile of oil-soaked shirts were found near the place where the fire started. It was suspected that someone, using the fire escape to gain access to the attic, attempted to destroy the building by igniting some rags. This time, the firemen saved the majority of the building by confining the fire to the attic. In spite of the heavy smoke and water damage, the school’s administration decided to continue classes in the building. ("Building"). Two more times, MHS would be forced to move, however these moves were due to a rapidly expanding student body. Marion High School Graduating Class, June 3, 1892. Marion High School has produced many talented students. According to available records, the first student to graduate from Marion High School was Alice Davis, in the year 1877. Later in life, she was employed as a principal in the Marion Community Schools (Cactus 55). After this first graduation, six years passed until another student received a diploma from the school. This second graduating class of Marion High School consisted of seven members, all females (Weaver 6). By the year 1906, a total of 439 students had received diplomas from MHS. Despite the fires, enrollment at the high school had increased rapidly. Between the years 1883 and 1906, it rose from seventy-seven students to nearly four hundred (Cactus 55). One of these four hundred was Asenath Peters-Artis. Graduating in 1888, she was the first African-American student to receive a diploma from Marion High School. After graduation, she attended a normal school, became a teacher, and worked as a reporter for a Marion newspaper (Cactus 89). As the number of students grew, the curriculum at Marion High School underwent great change. In 1882, A.H. Hastings, the superintendent of the school, worked hard to raise the standard of education at MHS by improving the curriculum. During August of 1882, he produced a "Course of Study and Rules and Regulations" for all high school grade levels. These were readily accepted by the school board and became Marion High School’s first detailed curriculum (Weaver 5). Students were given choices between Latin and German and between physical geography and manual arts. The honor system was typically used regarding school policies, thereby eliminating the need for a detailed system of school rules (Whitson 327). In 1889, several years before the state mandated the change, the high school course of study was extended to require four years of high school work in order to graduate (Weaver 5). By 1912, graduation requirements had become even more rigorous. In order to graduate, a student needed thirty-two credits, each credit signifying the completion of eighteen weeks in a particular subject (Whitson 327). To enhance the curriculum, Marion High School provided the best available equipment to its students. When they studied astronomy with the assistance of a telescope rather than with books alone, students learned more and produced more (Weaver 6). In 1897, a laboratory was installed for executing science experiments and for allowing students an opportunity at "hands on" learning. According to Welford Weaver, "the excellence of the work done in the Marion High School, by teachers and pupils, is recognized throughout the State both by public school and by university men" (Weaver 6). 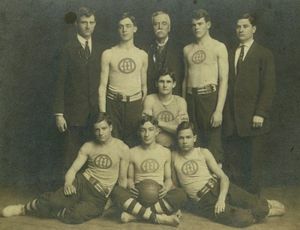 The 1905 Marion Giants Basketball team. Many clubs, organizations, and athletic teams have been offered to the Marion High School student body over the years. 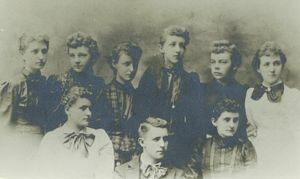 In 1897, MHS students participated in S.A.C.A., S.O.D., Phi Epsilon Iota, and Pi Upsilon Nu, to name a few. S.A.C.A. was a group that promoted social and athletic sporting events and fostered football and bicycling. S.O.D. was a group of young men who studied Shakespearean literature and encouraged literary debates throughout the school. Phi Epsilon Iota and Pi Upsilon Nu were Marion High’s two Greek letter fraternities. These groups helped to keep the young women busy through social events and discussions of topics relevant to young women (Juggernaut 27-30). Marion High School has always been proud of the "Giants." In athletics, by 1906, MHS offered football, polo, boys' and girls' basketball, and track, and competed with schools such as Huntington, Kokomo, and Logansport. There was also athletic competition within the school. Different clubs would create teams and compete against other clubs (Cactus 62-79). As MHS grew, so did its faculty. In 1877, I.W. Legg became the first superintendent and principal of Marion High School (Cactus 54). These offices were combined until the year 1882, when A.H. Hastings became the new superintendent of schools, and Phariba White became the principal. Until 1883, the principal did all of the teaching, although he or she was helped by the superintendent. In this year, an assistant principal was hired, making two teachers in the school (Cactus 55). When the new high school building was opened in 1891, distinct departments took shape. Russell Bedgood was the principal and also taught Latin. The rest of the faculty consisted of Alva Graves, a math teacher; Minnie Tresslar, English; Herriott C. Palmer, History; and Frances Anderson, Science teacher (Weaver 5). By 1906, there were thirteen teachers in the school, with three in English, three in Latin and German, two each in Math and Science, and one each in History, Philosophy, and Art (Cactus 55). "Building is Set on Fire Third Time." Marion Daily Leader. 25 Sep. 1908. Cactus. 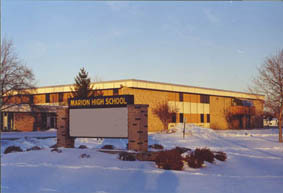 Marion High School. 1906. "City High School Destroyed by Fire." The Marion Chronicle. 26 Mar. 1906. The Juggernaut High School Annual. Marion, IN: E.L. Goldthwait, 1897. "Marion's High School Building Burns Causing a Loss of About $80,000." The Marion Chronicle. 17 Nov. 1902. Weaver, Welford D. "School History." The Juggernaut High School Annual. Marion, IN: E.L. Goldthwait, 1897. Whitson, Rolland Lewis, ed. Centennial History of Grant County Indiana 1812 to 1912. Vol. 1. Chicago: Lewis Publishing Company, 1914. "Will be no Delay in Work on Building." The Marion Chronicle. 19 Nov. 1902. View of the west side of the square, taken from the top of the courthouse. At the top of the photo is the old Marion High School building. These men are digging the basement of the second Marion High School in 1916. Second Marion High School, shortly after its construction in 1917 on corner of Nelson and 'A' St.
Card with The "Wonder Five" basketball team photo, Marion High School basketball team, 1921-22. View from the side of the Marion High School at Nelson and 'A' Street during its demolition, 1976-77. View of the demolition of Marion High School at Nelson and 'A' St., 1976-77. Demolition of the Marion High School on Nelson & 'A' St., Marion, IN, ca. 1977. Group of Marion High School Football players, members of the undefeated/untied 1969 Giants. Their record was 10-0 for that season. The Marion High School building on 26th St., aerial view, ca. 1967. Marion High School has been a part of the Marion Community School System for well over a century now, and it has been housed at many different locations over these years. The most recent building is located at 750 W. 26th Street in Marion, Indiana. A growing student population necessitated the new facility. The structure was built in the early 1960s with two major additions constructed in the late 1960s into 1970. The new campus was first built as a second campus for Marion High School. The old facility was slowly phased out and replaced by the new one. This Marion High School campus facilitates the education of thousands of students every year. At the time it was built, the "South Campus" was a state-of-the-art facility, but the building at this location has now been in use for almost 40 years, and it has aged much over time. The Marion City Council got things moving in 1957, when it passed a petition to annex a 17.2-acre area of land, located between 22nd and 26th streets, for a new school building. ("School Ground Annexed By City"). Construction began on the first phase of the new high school in the spring of 1961. This first part would be opened in September of 1962. It would be attended by about 920 juniors and seniors starting in the fall of 1962. The new facility, once completely finished, would eventually replace the old one, which stood at the corner of Nelson and "A" street ("MHS Rises To Accommodate Its Pupils" 4). This would be the first year in several years that freshmen would attend the Nelson Street campus, ("Two Parts Make A Whole" 4) and space was needed for the extra 578 students ("Pictures Scheduled Thursday for Cactus" 9). .When the 1962-1963 school year began at Marion High School, two campuses came into use. Both schools collectively were called "Marion High School," and the old and new campuses individually were called the "North Campus" and the "South Campus," respectively. The total student registration for the year was 2,130, with 900 attending the new South Campus. For this first year with a new campus, food would be prepared at the North Campus for both schools. The food needed at the South Campus would then be carried there in trucks. As it only housed around half of the Marion High School Students, the South Campus was definitely still unfinished ("Pictures Scheduled Thursday for Cactus" 9). One interesting new feature at the South Campus was a system of televisions. The campus included 36 televisions, each of which could receive six stations, including a closed-circuit channel for Marion High School. The total cost for the system was $36,000 ("Pictures Scheduled Thursday for Cactus" 9). When the system was installed, Marion High School became one of the first public secondary schools in the Midwest to install a closed-circuit television system. The South Campus of Marion High School became one of the pioneers of this new technology (Spilly and Radick, 97). Plans began early for the next parts of Marion High Schools South Campus. A total of $1,225,000 was appropriated for the building of a kitchen and cafeteria building and for the building of a vocational unit. Bids opened for both of these parts, along with a second academic unit, on October 10, 1962 ("$1.2 Million Approved For New School Unit" 1). The second academic unit, or "Building Two," was under construction but not finished for the 1963-1964 school year. It would be opened for the 1964-1965 school year. At the same time, the North Campus would be closed for the 1964-1965 school year, and would become a junior high school. The new campus was finally becoming a complete school ("We Are All Proud Of Our Two-Campus School" 4). In early 1968, the school board decided to create a facility for the physical education department. Walter Scholer from Lafayette and Gerald Guy from Marion were to design the plans for the new addition. Shambaugh & Son of Fort Wayne was the low bidder for mechanical contracting and Moorehead Electric Company of Marion was low bidder for electrical contracting. Reynolds-Judah of Indianapolis stayed the low bidder for the bleacher installation. Separate bids were made for a 10-classroom wing, the replacement of the aluminum swimming pool with a concrete pool, and the removal of air conditioning in the gym. The low total building bid of $3,356,398 was proposed on the first week of April in 1968. The general contractor contenders were Willsey Construction of Indianapolis, Bowman Construction of Marion, and Baystone Construction of Muncie. The school board debated over general contractor bids for the construction, but Bowman Construction won with a bid of $1,872,719 ("Board Tries to Cut Construction Price"). On May 2, 1968, Superintendent Bernard McKenzie of Marion Community Schools opened the groundbreaking ceremony for the construction of the physical education wing ("New Project"). The final plans for the new wing included 10 classrooms, a gymnasium, swimming pool, wrestling room and gymnastics area, and a planetarium. The gymnasium was planned to seat 8,000 spectators, but the plans in the bid called for the installation of only 3,000 seats ("Construction Underway at Marion High School"). The planetarium portion of the addition amounted to only $50,000 of the $3 million allotted to the physical education wing. By the 1969-1970 school year, the planetarium was in full operation. The circular domed room housed a display unit that could project approximately 1,400 "stars" ("It's Skyward Look for the Young Generation at Marion's New Planetarium" 1). 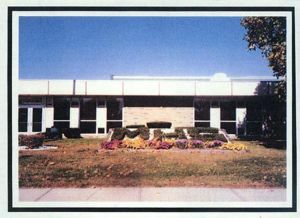 The physical education wing completion was anticipated for the fall of 1970, but it was finished before the 1970-1971 school year began ("Dedication Planned October 26th"). Another addition became necessary for Marion High School. The school needed housing for speech, music, and drama departments. It also needed an auditorium, as most of its performances had been held at McCulloch Junior High Schools auditorium. McCullochs auditorium had been growing old and did not have many of the features that had become standard in most auditoriums of the time. Planning and construction for Marion High Schools auditorium wing began in the late 1960s. Final plans for building an auditorium wing were set by October of 1968. Bids totalled $3,177,000. Bowman Construction and Moorhead Electric had already begun work on the schools physical education wing. Construction was set to begin in January 1969. 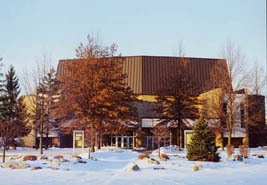 The wing was to be 85,000 square feet, and the auditorium itself was to have a capacity of 1,478. Construction went mostly as planned, with some exceptions ("Bid on Marion auditorium"). As construction proceeded, the finishing date got pushed back. By March of 1971, the expected time of completion had been moved to mid-summer 1971. The facility, "a dream come true," according to Jim Clark, a drama teacher at the time, also housed the art, music, speech, and drama departments. Classes began in these rooms at the beginning of the 1970-1971 school year. It had an incredible lighting and sound system. One construction worker commented, "Theres enough electricity in that building to light all of South Marion." There were 56 circuits for lighting, each of which could handle five 700-watt lights, for a total of 280 lights. 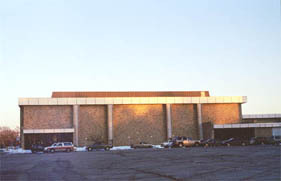 The auditorium wing became an important part of marion High School and the community of Marion ("MHS auditorium to be done by the middle of the summer" 10). The current Marion High School structure has aged through the years, and some major and minor problems are becoming quite visible. In the fall of 1997, the North Central Association accreditation team evaluated the building and documented its strengths and weaknesses. They stated, "the aging school facility is restricting classroom facilities in some areas of the curriculum and adversely affecting student morale." They recommended that issues pertaining to climate control, building infrastructure, and technology wiring be dealt with ("High school report card:"). In 2000, the administrators of the school began a study of the subject. The school corporation hired DLZ Indiana Inc., an architectural firm, to do a feasibility study on the building. The division manager for DLZ, Miguel Trevino, gave details on options for renovation or rebuilding. A new facility is another option for Marion Community Schools. Although the initial cost would be greater, maintenance costs for a new facility would be smaller. Trevino stated that "a partial renovation would make [the] costs higher in the long run." ("Building a new school an option"). Complete renovations would total $57.02 million. $1.87 million would be used for improvements in traffic flow, renovation and/or replacement of sporting facilities, landscaping, and signage. General building issues including floors, chalk and marker boards, increased dining area size, and compliance with the American Disabilities Act would cost $26.95 million. A new plumbing system, boilers, heating water pumps, and insulation would total $11.5 million. Another $5.9 million would be dedicated to electrical issues including an upgrade for the main distribution unit, new exterior light fixtures, an upgrade for the fire alarm protection system, and additional security cameras. The remaining $10.8 million would allow for contractor fees and equipment. The cost of a new structure on a new site would total $75.7 million. While the current structure of Marion High School has served its purpose in facilitating the education of thousands of children, it is showing its age. Renovations have become necessary and will need to be dealt with in the near future. ("Building a new school an option"). "$1.2 Million Approved For New School Unit." Leader-Tribune 13 Sept. 1962: 1. "2,000 Tour High School." The Marion Chronicle 12 Nov. 1962: 1. "Bid on Marion auditorium." Chronicle-Tribune 30 Oct. 1968. "Board Tries to Cut Construction Price." Chronicle-Tribune 11 April 1968. "Building a new school an option." Chronicle-Tribune 31 October 2000. "Construction Underway at Marion High School." Chronicle-Tribune 29 June 1968. "Dedication Planned October 26th." Chronicle-Tribune 18 October 1970. "High school report card:." Chronicle-Tribune 6 December 1997. "It's Skyward Look for the Young Generation at Marion's New Planetarium." Chronicle-Tribune 1 March 1970. "MHS auditorium to be done by the middle of the summer." Chronicle-Tribune 7 Mar. 1971: 10. "MHS Rises To Accommodate Its Pupils." Cactus 1962: 4-5. "New Project." Chronicle-Tribune 2 May 1968. "Pictures Scheduled Thursday for Cactus." Leader-Tribune 19 Sept. 1962: 9. "School Ground Annexed By City." Leader-Tribune 6 Feb. 1957. Spilly, Arnold D. and Gerald, Radick. "Closed Circuit TV Adds New Educational Dimension." Indiana Teacher November-December 1966: 97. "Two Parts Make A Whole." Cactus 1963: 4. The first part of this article, covering the 1870s through 1950s, is based on a paper created in May, 1999 by Matthew T. Voss, a Senior at Marion High School. It was created as a semester project for Advanced Placement English 12, and for the Community History Project. All of the research was done in the Indiana History Room of the Marion, Indiana Public Library. All pictures used in the photo gallery are from picture files in the Indiana History Room. The second part of this article, covering the years from 1951 to 2001, was created by Parker Fath and Aaron Shepler in 2001. This page was last modified on 20 April 2011, at 17:39.